This free invoice finance guide (which may be better called a guide to receivables funding) explains all the key information that you need to know if you are considering using this type of business funding. "Invoice finance is a way for a business to borrow money based on amounts due from customers that are businesses." 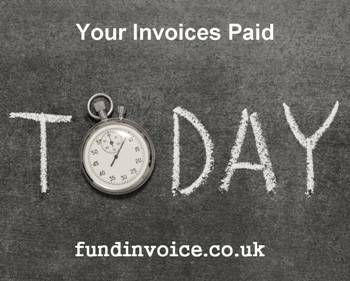 In very simple terms invoice finance means that a business can receive a "prepayment" against its unpaid sales invoices (typcially between 70% and 100% of invoice value), so that they don't have to wait for their customers to pay. When the customers do eventually pay, the balance of the invoice, less charges, is passed onto the business. If the business has a whole sales ledger of outstanding credit invoices, a large tranche of cash can be released in one go, when the prepayments against each invoice are combined. Having this kind of financial facility in place can significantly improve the cash flow and working capital position of a business. 98% of existing users would recommend invoice finance to other businesses. 87% of existing users said using these services enabled their business growth. On average companies use these services for just over 5 years. Only circa 1% of UK companies use sales finance as there is very little advertising and promotion in the UK. 78% of existing users have not checked their pricing, against the market, in over a year. We have found average savings of 34% for customers seeking cost reductions. These services are provided by "invoice finance companies", of which there are over 80 in the UK. Some are specialists handling particular types of products or industry sectors, others provide the full range of services. There are a growing number of "fintech" providers, who essentially provide their services via online platforms. In some cases these may provide cheap funding, but that is not always the case in this market and you can often find a small independent company that will quote cheaply as they are keen to acquire your business. Fintechs can be very effective for some businesses, but others provide a more traditional approach of a small independent company that provide a personal service. The key is to understand exactly what you are looking for and to match the provider accordingly. The service element of any facility is particularly important. It is not always like a mortgage, you just need the money as cheaply as possible. There can be a varying amount of service provided. For example, if the provider is also collecting your sales ledger for you, you will need to ensure that they are able to provide a high level of service quality as they will have regular direct contact with your customer. We have undertaken extensive service quality comparison research between different providers. we have found that average service quality ratings (given by existing clients) have ranged from 4 out of 10 up to 9 out our 10, depending upon the provider. We have found a 125% range between the worst and best service providers within the industry. This is a dramatic deviation that should be a concern for anyone thinking of using these services. We can provide guidance about service levels based on the research that we have undertaken. The providers can also be divided according to the organisations that provide their backing. Those that are bank owned (by this we tend to mean high street banks) or those that are independent. Even the independents are often owned by very large organisations that you will recognise e.g. Hitachi, Close Brothers or Siemens etc. There are also a number of smaller companies that are not part of large groups. The type of partner that you choose will tend to be driven by the nature of your situation and what you need. For example, we have undertaken a lot of market research into service quality levels amongst providers. Some of the indpendents scored very well when rated by their clients for the service that they provided. We found 45% higher satisfaction ratings amongst the clients of independents versus banks. That said, banks also have their place in addressing large lending requirements, that may exceed what many of the independents are able to handle, and banks can often offer some very fine rates based on the scale of their operations. There can be many benefits from using this kind of service, we will attempt to give a full explanation of the benefits below. Firstly, receiving a cash injection can greatly improve your working capital position. As you raise new invoices, so further prepayments are released, such that you are now always waiting for your debtors to pay your sales invoices. This can improve your cash flow by creating more liquidity within your business. Improved cash flow. You can use the additional working capital for any purpose, including settling pressing creditors, wages, HMRC or investing in expansion and taking on large orders and projects. You can also approach suppliers for discounts if you can now pay cash for raw materials and supplies. Availability of finance to businesses that may not qualify for traditional forms of funding e.g. overdrafts and loans. The nature of these facilities means that the financier is in a safer position (relying on your book debts to recover their advance if required) so that they can take a more liberal view on providing funding. Confidentiality so that customers don't know you are using the service. Cost savings from outsourcing your credit control activity (if applicable). Help collecting export invoices (again if you select that option). Flexibility to dip in and out of using the service - if you choose a selective facility. Other additional add-on services such as payroll management and trade finance to pay for imports. Electronic access - most providers have some form of electronic access package that allows you to submit invoices, draw down funds and manage your account via an electronic interface. There are numerous different types of product under this banner term. The phrase is an umbrella term for a wide range of financial product variants that can be broken down in a variety of different ways. In many ways the term "receivables finance" (or accounts receivables finance, or receivables discounting) is actually more comprehensive as it includes other ways of charging for transactions e.g. applications for payment that are used in the construction sector, instead of invoices. Some providers also use proprietary product names, which can complicate matters further. There are two broad product options, factoring and invoice discounting - in simple terms discounting is just the finance, and factoring includes a credit control service. I have written in some detail about the various types of factoring and the types of invoice discounting that are available. Non recourse means that the service includes bad debt protection, such that the funder will cover a shortfall if an approved customer fails to pay and invoice that falls within a pre agreed credit limit. Recourse means that the risk is yours, after a specified time period, known as the recourse period, the funding is withdrawn and has to be repaid (often in practice by funding granted against other invoices). You can achieve a similar situation by having a stand alone credit insurance policy for your business. However, this can provide more expensive as with bad debt protection, the provider is often purchasing one bulk credit insurance policy to cover all of their customers. Selective (also called "Spot" or single invoice finance - SIF) means that you pick and choose which invoices you want funding against. Often with no obligation to ever use the service again. This can be helpful if you have seasonal cash flow pressures. The alternative is "whole turnover" (sometimes called full turnover or a revolving credit line) where you discount all your transactions. This provides the maximum cash flow benefit. Confidential services are operated such that your customers are unaware of the funders involvement. Even if they are providing a credit control service, it is undertaken using the name of your company. The alternative is disclosed, whereby customers are openly aware that there is a funder involved. Allowing confidentiality is considered an additional risk, so it tends to be provided to companies of a better credit standing, whereas a disclosed option can be available to almost any business including those in a CVA or those with a poor credit history such as CCJs. Payroll management - outsourcing the task of running your staff payroll. Overpayments - if you have a peak cash flow requirement, many funders are able to provide a temporary overpayment, or cash flow loan, to help you. Trade finance - this is additional funding to help you pay for imports. Specialist services - there are further tailored products aimed specifically at certain sectors e.g. recruiters or construction firms. The qualification criteria are driven by the type of service that you are seeking. However, the nature of these service is such that some form of funding can be made available to most businesses, regardless of their financial situation. In fact, this type of funding can often offer a lifeline to a business that is in trouble with creditor pressure or preferential creditor arrears e.g. HMRC, VAT, PAYE, NI bills that are due or overdue. The key is that the provision of finance is based on the strength of your debtor book i.e. the simplicity of collection of your invoices combined with the creditworthiness, and spread of risk amongst your debtors. In this way it is not about the strength of your company, rather your customers. The basic requirement is that you are a company selling to other businesses, on credit terms. It doesn't matter if you are a new startup or an established business. Similarly, size is not problem, various funders will handle all sizes of company. There is no minimum turnover, or maximum turnover - the same applies to the level of funding required. There are also niche retail finance products that can allow a retailer (who doesn't sell to other businesses on credit terms) to get funding against the volume of sales transacted through their credit card machine. The criteria will also vary between different providers. Some will take a more cautious view than others, not all will handle startups or companies that are in distress. However, there are various providers that will address all niches, and all circumstances. You raise your invoices (or applications for payment in the construction sector). You submit them to the financier (either individually, which is normally by uploading an electronic file, or as part of a full sales ledger upload from your accounting software). The financiers makes available a percentage of the face value of the new invoices. You can choose to draw that money down into your bank account. Either you chase in the payments from the debtors, or a factoring organisation does it for you. The money from the payments ends up in an account controlled by the financier, repaying the advance. The financier makes available the remaining percentage of the invoices, less their charges. The whole process can be handled in a manner that is totally confidential from your customers, this can be with or without a credit control service being provided in the name and branding of your business. You can find more detail about how invoice finance works here. The pricing varies depending upon the type of product used and the pricing policy of the provider that you choose. We have undertaken pricing comparison research, for products such as recourse factoring, and we have identified wide ranges in pricing quoted to the same company. For example, in a recent mystery shopper exercise, we found a pricing variation of 165% between the most expensive and the cheapest quote. The way the charges are structured is explained in this article: Invoice finance pricing, it also has links to examples of indicative pricing for various product variations and sizes of business. For selective (where you choose individual invoices to fund) c. 2% per month of the funds drawn, for the time the funds are used. For whole turnover (where you fund all your invoices - subject to approval by the funder) between 0.2% of turnover and 3.5% or turnover, with discount (similar to interest) charges at between 1% and 3.5% over bank base rate. For whole turnover, you can have alternatively opt for an all inclusive, bundled fee which starts from £3,000 (+ VAT if applicable) per annum. Even if you look at those parameters and think you need a better rate, it may still be possible to achieve that as the providers will often pull out all the stops to quote for a deal that they want to win. There are numerous pricing offers available at any time and there is a great deal of competition between providers. The amount of funding provided varies again according to the product, the provider and their opinion of the level of risk that your account presents. Typically 85% if a normal headline rate for core sectors that are often discounted. However, rates can rise to 100% for sectors such as car body repairs and one provider is currently advertising up to 120% if other assets are included in their security. In sectors such as construction, 70% is a more typical funding percentage. The actual level of funds advanced may be subject to additional deductions such as debtor credit limits, prime debtor restrictions and disapprovals due to ageing, to name but a few. When choosing a provider it is very important to understand exactly how they will calculate the level of funding and any restrictions that they will apply. This can be a tricky area on which you should seek advice. The ABFA (Asset Based Finance Association) recently became part of UK Finance, and it is the trade body responsible for many of the providers within this market. However, not all providers are members. Those that are are subject to a code of conduct that is backed up by an Ombudsman process through which you can escalate complaints. It may be worth checking if the providers that you are considering are members. Having said that, the level of complaints has been extremely low with only 60 being escalated to the Ombudsman during the last 4 years. This is another testament to the general levels of satisfaction amongst existing users. If you have an issue with your provider, we have extensive guidance on our website about how to deal with complaints about invoice finance. If you need more help please call Sean on 03330 113622 but we hope you have found what you need in our free guide to invoice finance.